TC Electronic SpectraComp Bass Compressor: SpectraComp Bass Compressor is the tiniest big thing to hit the world of bass in a long time. This ultra-compact and highly intuitive multiband compressor, is made to bring out all of the glorious low-end punch and presence of your beloved bass in the most transparent and musical way you've ever heard. Just turn it on and take charge of the groove. 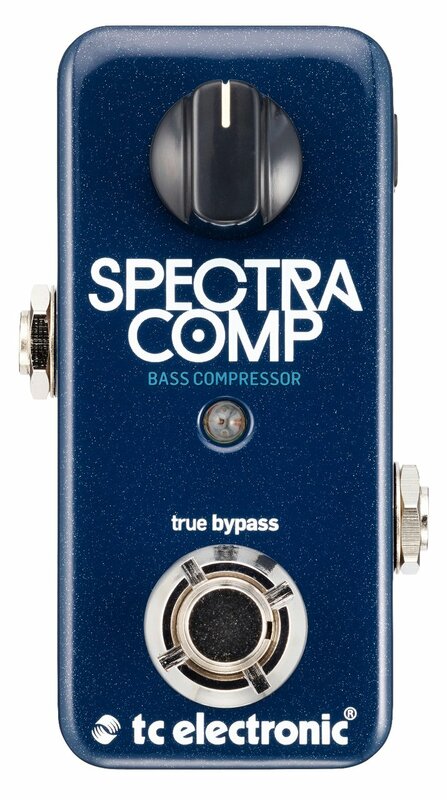 SpectraComp Bass Compressor contains the same high-quality MD3 dynamics engine known from our studio production powerhouse, System 6000. A dynamics engine that has been used on countless hit-records and massive blockbuster movie productions. This advanced algorithm applies perfectly tweaked compression for your high, mid and low frequencies to create a more unified and balanced sound where your low strings never overtake your highs, something that's simply not possible with the one-size-fits-all compression known from a typical stompbox. This way you'll get a tight and punchy attack, with endless sustain all without ever compromising the natural low-end response of your bass. Picture SpectraComp Bass Compressor as an ice cream. It's smooth, delicious and easy to love. But maybe you want to super-pimp your ice cream with cherries, chocolate sauce and sprinkles shaped like unicorns? You want to make that tone-sundae your own. This is where TonePrint comes into play. Via the free editor you can customize your own compression tone through a wealth of deep editing parameters, so it suits your rig perfectly. You can also try on custom pre-made tones via the free app for Android and iOS. Tone tweaking just leveled up.